Objective: To evaluate the effect of percutaneous closure of patent ductus arteriosus (PDA) on left ventricular (LV) systolic and diastolic function in children. Background: Limited studies are available on alteration in LV hemodynamics, especially diastolic function, after PDA closure. Methods: Thirty-two consecutive children with isolated PDA treated by trans-catheter closure were studied. The LV systolic and diastolic function were assessed by two-dimensional (2D) echocardiography and tissue Doppler imaging 1 day before the PDA closure, on day 1, and on follow-up. Results: At baseline, none of the patients had LV systolic dysfunction. On day 1 post-PDA closure, 8 (25%) children developed LV systolic dysfunction. The baseline LV ejection fraction (LVEF), LV end-systolic dimension (LVESD), and PDA diastolic gradient predicted the post-closure LVEF. Patients who developed post-closure LV systolic dysfunction had poorer LV diastolic function than those who did not. LV diastolic properties improved after PDA closure; however, the improvement in LV diastolic properties lagged behind the improvement in the LV systolic function. All children were asymptomatic and had normal LVEF on follow up of >3 months. Conclusions: Percutaneous closure of PDA is associated with the reversible LV systolic dysfunction. Improvement in the LV diastolic function lags behind that in the LV systolic function. Patent ductus arteriosus (PDA) is an acyanotic congenital heart disease with a left-to-right shunt. Hemodynamically significant PDA leads to a left ventricle (LV) volume overload and remodeling. Percutaneous PDA closure has proved to be safe and effective with short- and long-term results comparable to surgical closure. ,,, LV volume overload and compensatory remodeling alters the systolic and diastolic function of the LV as in chronic aortic and mitral regurgitation. ,, These changes are expected to improve after PDA closure; however, some patients develop LV systolic dysfunction. Left ventricular diastolic properties are also altered in patients with PDA and other conditions with volume overload. Reduction in the preload and gradual reverse remodeling is likely to improve the diastolic function after PDA closure. The present study was conducted to evaluate the LV systolic and diastolic function in children before and after transcatheter closure of the PDA using two-dimensional (2D) echocardiography and tissue Doppler imaging (TDI) and to identify predictors of the post PDA closure LV systolic dysfunction. Thirty-four consecutive children, who were planned for trans-catheter closure of PDA were enrolled in this prospective observational study. All patients had clinical and/or echocardiographic evidence of hemodynamically significant PDA. They underwent successful transcatheter PDA closure between February 2009 and May 2009. Patients with silent PDA, PDA not suitable for percutaneous closure, irreversible pulmonary vascular disease (pulmonary vascular resistance index i.e. PVRI > 7 WU.m 2 ), and those who had associated hemodynamically significant congenital heart disease or a significant residual shunt were excluded from the study. The study approval was obtained from the institutional ethics committee and written informed consent was obtained from the patients' parents in all cases. Transthoracic 2D echocardiography and TDI was performed by a single investigator with the patient in the supine position using VIVID 7 (General Electronics) with a 4 or 7 MHz transducer on an outpatient basis at baseline, one day after the procedure and follow-up (at least 3 months after the procedure). LV systolic dysfunction was defined as a post-PDA closure absolute LVEF of <50% and/or reduction in LVEF of ≥10% from the baseline. LV end-diastolic and systolic volumes (LVEDV and LVESV, respectively) were averaged over three cardiac cycles in the apical four-chamber view by the area length method and were indexed for the body surface area (BSA). For diastolic function analysis, the mitral inflow signal was acquired from three cardiac cycles in the apical four-chamber view. Mitral E, A, E deceleration time (EDT), E/A were assessed as per standard method. In addition mitral E time velocity integral (E TVI), A time velocity integral (A TVI) and E TVI/A TVI were also analysed. Mitral annular diastolic velocities in early diastole (E') and late diastole (A') were obtained by tissue Doppler imaging and E/E' was calculated. Anatomic attributes of the ductus were assessed for size, minimum diameter toward pulmonary end, shape, orientation of PDA as well as adequacy of the ampulla on the aortic end. The PDA size was measured in the parasternal short axis and ductal view. Left atrial and aortic dimensions were also measured simultaneously. After obtaining informed consent, cardiac catheterisation was done for assessment of pulmonary artery pressure and shunt quantification. Only venous access was obtained during the study. PAH was defined as mean PA pressure >25 mm Hg. Angiographic assessment was done after crossing the PDA and placing pigtail in descending thoracic aorta. Angiograms were performed in standard lateral view for PDA sizing. In selected cases right anterior oblique (RAO) view was also used for better visualization of PDA. After sizing, PDA was closed using ductal occluder by standard technique. Amplatzer type (Cocoon) ductal occluder device (Vascular Innovations Co. Ltd., Bankok, Thailand) was used in all subjects. After device deployment, echocardiographic assessment was done for the device position, and descending thoracic aortic and left pulmonary artery velocity. The ductal occluder device was released after excluding the significant residual shunt and obstruction in aorta and/or left pulmonary artery. Statistical analysis was done with the standard SPSS software (version 15, Chicago, IL, USA). Categorical data were presented as frequencies and compared using the Fisher exact test. Continuous variables were presented as mean ± SD and compared using the two-tailed Student's t-test. Correlation between two continuous variables was evaluated using linear regression and Pearson's correlation analysis. Multiple stepwise linear regression analysis was performed to identify the determinants of the post-closure LVEF. A P value of <0.05 was considered significant. Thirty-four patients were included in the study. Two of these were not analysed as they had a significant residual shunt across ductus arteriosus. Thirty-two patients were followed up. The mean age of the patients was 48 ± 39 months (median 35 months, range 8-150 months). Fourteen (44%) patients were aged ≤24 months. There were 23 girls and 9 boys (female-to-male ratio 2.5). The mean follow-up duration was 139 ± 30 days. Cardiac catheterization revealed that four (12.5%) patients had pulmonary hypertension. All subjects underwent PDA closure using the Cocoon ductal occluder device (Vascular Innovations Co. Ltd., Bankok, Thailand). The mean angiographic PDA size at the pulmonary end was 3.1 ± 1.2 mm. The median device size (at pulmonary end) used was 6 mm (mean 5.6 ± 1.5 mm). None of the study subjects had baseline LV systolic dysfunction. There was a significant reduction in Left ventricle end-diastolic dimension (LVEDD), LVESD and LVEF in immediate post closure as compared to baseline values. Indexed left ventricular end-diastolic volume (LVEDVI) decreased but, the change in the indexed left ventricular end-systolic volume (LVESVI) was not significant (P 0.2). Eight (25%) patients had LV systolic dysfunction by predefined criteria (four patients had LVEF < 50% and four patients had LVEF reduction of ≥10% from the pre-closure state). During follow-up, there was further reduction in LVEDD, LVEDVI as well as in LVESD and LVESVI, while LVEF improved [Table 1]. There was significant reduction in mitral E and A velocity; however, the E/A ratio did not change significantly on day 1 post-PDA closure. Mitral E TVI and E TVI/A TVI showed significant reduction while mitral A TVI did not change. Mitral E/E' also showed significant reduction from 10.7 ± 3.7 to 9.9 ± 3.3 (P 0.03). On follow-up, compared to the day 1 post-closure state, mitral A velocity and mitral A TVI reduced while there was prolongation of EDT and increase in mitral E TVI/A TVI. There was insignificant reduction in mitral E and E TVI. There was a significant increase in mitral E' velocity; however, the change in the mean mitral E/E' ratio was not significant. 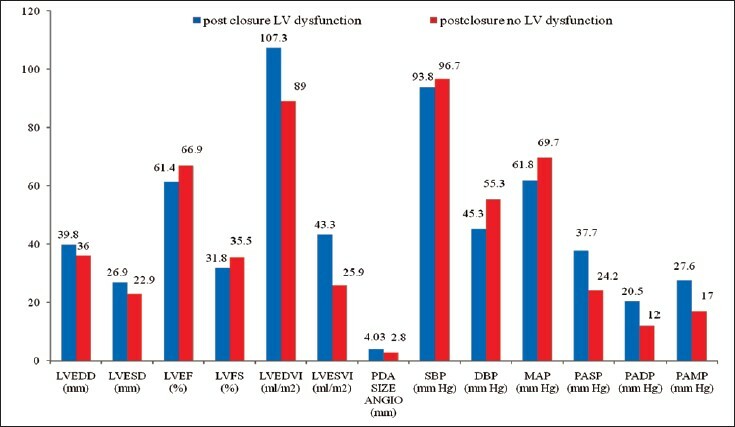 By ROC analysis, the area under the curve for pre-closure LVEF was 0.97, and pre-closure LVEF ≥ 63.5% showed a sensitivity of 83% and specificity of 87% in predicting the immediate postclosure normal LV systolic function. Preclosure LVESD ≥ 24.5 mm, LVEDVI ≥ 85.5 ml/m 2 , LVESVI > 32 ml/m 2 , PDA size ≥ 3.1 mm, and mean PA pressure ≥ 19.5 mm Hg predicted the immediate postclosure LV systolic dysfunction [Table 2], [Figure 2]. In patients who developed LV systolic dysfunction compared to patients who did not, the mean mitral E velocity was similar while the mitral A velocity was significantly higher with a lower E/A ratio, longer mitral EDT, lower mitral E TVI, higher A TVI, and lower E/A TVI [Table 3]. They had a lower mean mitral E' and higher mitral E/E'. Thus, these patients had an abnormal diastolic filling pattern compared to those who did not develop LV systolic dysfunction after PDA closure. In this subgroup, the assessment on day 1 post-PDA closure showed that the changes in mitral E/A, EDT, E TVI, A TVI as well as E/A TVI were not significant. In contrast, the changes in patients with normal post-closure LV systolic function were significant. The changes in mitral E' and E/E' was insignificant irrespective of LV systolic function. Overall there was no significant alteration in diastolic properties in patients who had postclosure LV systolic dysfunction. In contrast, patients with normal postclosure LV systolic function showed relative reduction in the late diastolic filling component of LV filling. At follow-up, there was a significant reduction in A TVI and increase in E/A TVI. These changes further suggest late reduction in the contribution of late diastolic filling. However, the changes in EDT, mitral E', and E/E' ratio were not significant. There was significant reduction in mitral E, A, A TVI, E/A, and TVI, and prolongation of EDT in patients with normal post closure LV systolic function. In contrast, patients who developed post-closure LV systolic dysfunction continued to have abnormal diastolic filling at follow up. Prior studies have shown that subjects with PDA have higher LVESVI and LVEDVI, lower LVEF, and higher N-terminal brain natriuretic peptide (BNP) compared to controls. These changes were documented to resolve during 6-month follow-up after percutaneous PDA closure. There are limited reports of preclosure LV systolic dysfunction in patients with PDA. , None of the subjects in the current study had baseline LV systolic dysfunction. Jeong et al. reported persistent LV systolic dysfunction in 11% of adult patients who underwent PDA closure. In contrast, our study showed complete spontaneous resolution of LV systolic dysfunction at follow-up which is consistent with observations made by Galal et al.,  Eerola et al.,  and Kim et al. This discrepancy is probably related to the longer duration of volume overload and consequently more extensive and irreversible changes in LV in adults compared to children. Baseline LVEF, extent of LV dilatation (LVESVI), and PDA diastolic gradient predicted post-closure LV systolic function. Kim et al. in their retrospective study found that Qp/Qs > 1.6 and the ratio of pulmonary artery pressure/systemic artery pressure > 0.32 predicted the reduced postclosure LV systolic function. However, in the present study, none of the parameter such as LVESD, LVEF, LVESVI, LA/Aorta ratio, PDA size, PDA systolic or diastolic gradient, and pulmonary artery pressures predicted post-closure LV systolic dysfunction on multivariate analysis. Diastolic function assessment in patients with PDA is confounded by increased preload and mitral inflow. In absence of definite criteria for diastolic dysfunction in children with PDA, descriptive analysis was used in the present study. The reduction in E TVI and E/A TVI without significant alteration in E/A ratio points to altered LV filling pattern in immediate post closure state wherein late diastolic filling contributed more to total LV filling. These changes in E velocity, E TVI without change in EDT are consequent to decreased preload in hypertrophied LV. Late reduction in mitral A velocity and A TVI with significant increase in E/A TVI ratio and EDT without further change in E velocity at follow up suggest improvement in diastolic properties of LV and thereby reducing relative contribution of late diastolic filling in total LV filling. These findings corroborates with anticipated slow reversal of altered diastolic properties of LV after PDA closure. Cardiac lesions with increased stroke volume needs caution in assessment of mitral E/E' considering possible misinterpretation due to increased E.  Rapid reduction in preload as well as alteration in stroke volume further complicates interpretation of mitral E/E' in post closure state. In present study, the mitral E' did not change while E/E' ratio showed reduction in immediate post closure state is due to reduced preload and mitral E velocity and not due to change in mitral E'. The late improvement in mitral E' with minimal alteration in mitral E velocity is secondary to improvement in diastolic properties. These alterations in diastolic properties provide insight into adverse effects of chronic volume overload. This prospective study adds to the observations on LV systolic dysfunction after PDA closure and also documents rapid and complete recovery of LV systolic function on follow up. We also studied changes in LV diastolic properties as well as their correlation with the post-closure LV systolic function. The slower and lesser extent of improvement in patients with post-closure LV systolic dysfunction points to unfavorably altered myocardial properties secondary to volume overload compared to those who did not have systolic dysfunction. The major limitation of the study was the small sample size which limited its power, especially in subgroup analysis. Further, the parameters used for the assessment of LV systolic function, though in concordance with previous studies, were preload dependent which could affect the interpretation in the post-PDA closure state. The use of relatively preload independent parameters like isovolumic acceleration (IVA)  might have improved the specificity. Percutaneous closure of PDA is associated with reversible LV systolic dysfunction. Improvement in LV diastolic function lags behind that in LV systolic function. Baseline LVEF ≥ 63.5% predicts normal post PDA closure LV systolic function. 1. Masura J, Tittel P, Gavora P, Podnar T. Long term outcome of transcatheter patent ductus arteriosus closure using Amplatzer duct occluders. Am Heart J 2006;151:755.e7-10. 2. Masura J, Walsh KP, Thanopoulous B, Chan C, Bass J, Goussous Y, et al. Catheter closure of moderate to large sized patent ductus arteriosus using the new Amplatzer duct occluder: Immediate and short term results. J Am Coll Cardiol 1998;31:878-82. 3. Bilkis AA, Alwi M, Hasri S, Haifa AL, Geetha K, Rehman MA, et al. The Amplatzer duct occluder: Experience in 209 patients. J Am Coll Cardiol 2001;37:258-61. 4. Faella HJ, Hizazi ZM. Closure of the patent ductus arteriosus with the Amplatzer PDA device: Immediate results of the international clinical trial. Catheter Cardiovasc Interv 2000;51:50-4. 5. Bonow RO, Lakatos E, Maron BJ, Epstein SE. Serial long-term assessment of the natural history of asymptomatic patients with chronic aortic regurgitation and normal left ventricular systolic function. Circulation 1991;84:1625-35. 6. Enriquez-Sarano M, Avierinos JF, Messika-Zeitoun D, Detaint D, Capps M, Nkomo V, et al. Quantitative determinants of the outcome of asymptomatic mitral regurgitation. N Engl J Med 2005;352:875-83. 7. Enriquez-Sarano M, Tajik AJ, Schaff HV, Orszulak TA, McGoon MD, Bailey KR, et al. Echocardiographic prediction of left ventricular function after correction of mitral regurgitation: Results and clinical implications. J Am Coll Cardiol 1994;24:1536-43. 8. Galiè N, Hoeper MM, Humbert M, Torbicki A, Vachiery JL, Barbera JA, et al. Guidelines for the diagnosis and treatment of pulmonary hypertension: The task force for the diagnosis and treatment of pulmonary hypertension of the European Society of Cardiology (ESC) and the European Respiratory Society (ERS), endorsed by the International Society of Heart and Lung Transplantation (ISHLT). Eur Heart J 2009;30:2493-537. 9. Corin WJ, Sutsch G, Murakami T, Krogman ON, Turina M, Hess OM. Left ventricular function in chronic mitral regurgitation: Preoperative and post operative comparison. J Am Coll Cardiol 1995;25:113-21. 11. Jeong YH, Yun TJ, Song JM, Park JJ, Seo DM, Koh JK, et al. Left ventricular remodelling and change of systolic function after closure of patent ductus arteriosus in adults: Device and surgical closure. Am Heart J 2007;154:436-40. 12. Eerola A, Jokinen E, Boldt T, Pihkala J. The influence of percutaneous closure of patent ductus arteriosus on left ventricular size and function: A prospective study using two and three dimensional echocardiography and measurements of serum natriuretic peptides. J Am Coll Cardiol 2006;47:1060-6. 13. Kim YH, Choi HJ, Cho Y, Lee SB, Hyun MC. Transient left ventricular dysfunction after percutaneous patent ductus arteriosus closure in children. Korean Circ J 2008;38:596-600. 14. Rapacciuolo A, Losi MA, Borgia F, De Angelis MC, Esposito F, Cavallaro M, et al. Transcatheter closure of patent ductus arteriosus reverses left ventricular dysfunction in a septuagenarian. J Cardiovasc Med (Hagerstown) 2009;10:344-8. 15. Choong CY, Herrmann HC, Weyman AE, Fifer MA. Preload dependence of Doppler-derived indexes of left ventricular diastolic function in humans. J Am Coll Cardiol 1987;10:800-8. 16. Bruch C, Stypmann J, Gradaus R, Breithardt G, Wichter T. Impact of stroke volume on mitral annular velocities derived from tissue Doppler imaging. Heart 2005;91:243-4. 17. Dalsgaard M, Snyder EM, Kjaergaard J, Johnson BD, Hassager C, Oh JK. Isovolumic acceleration measured by tissue Doppler echocardiography is preload independent in healthy subjects. Echocardiography 2007;24:572-9.